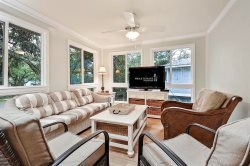 3 Bedroom Cottage on the Kiawah River- Great location! Located along a tidal creek of the Kiawah River and only 3 blocks from the beach, the gated community of Inlet Cove Cottages is a perfect family vacation destination. Swimming in the community pool, fishing, crabbing, and beach combing, are just a few of the many activities waiting to be enjoyed. Kiawah Island also offers five championship golf courses, two tennis centers, parks, over 30 miles of bike paths, plus 10 miles of white sandy beaches. Newly remodeled and one of the best in the neighborhood, 80 Inlet Cove is an ideal location on the island. When driving up to the cottage, you can't help but notice the natural landscape. You have ample parking in the car port and driveway. Entering the unit, you will notice the beautiful new furnishings and decor in the open concept living, kitchen, and dining areas. The newly renovated kitchen features custom cabinetry, granite countertops, and stainless steel appliances. With stylish, comfortable furnishings in the living room and flat screen TV, you are sure to relax after a long day of exploring. This area is open to the dining table, seating 6, and flows in to the kitchen that also has two bar stools for extra eating space. There are also two arm chairs for relaxing or conversing while prepping in the kitchen. There are 3 bedrooms and 2 baths in this cottage. The Master bedroom will be off the living room and connected to the back porch. This room has a Queen size bed, private bathroom with premium shower and flat-screen TV. The second room has a Queen and third room has two twin beds and share a bathroom. The room with two twins also has a TV. Relax on the lovely screened porch with amazing nature views. Head out to go crabbing on the community bridge just behind the cottage or enjoy fishing just across the street at the community dock. For some real adventure, take the island bike paths over to Freshfields Village or Bohicket Marina for wonderful shopping and dining or ride over to Captain Sam's Spit to watch the dolphins frolick in the water! Watch the beautiful sunset and the wildlife play at the community dock overlooking the Kiawah River (chairs and tables provided)! For your convenience, this cottage does come with a washer and dryer, as well as WiFi. Need more space? We also manage a couple other Inlet Cove Cottages- 106, 50, & 51! Dock: Inlet Cove Community Dock- Kayak Launch And Paddle Board Launch Available From This Dock!